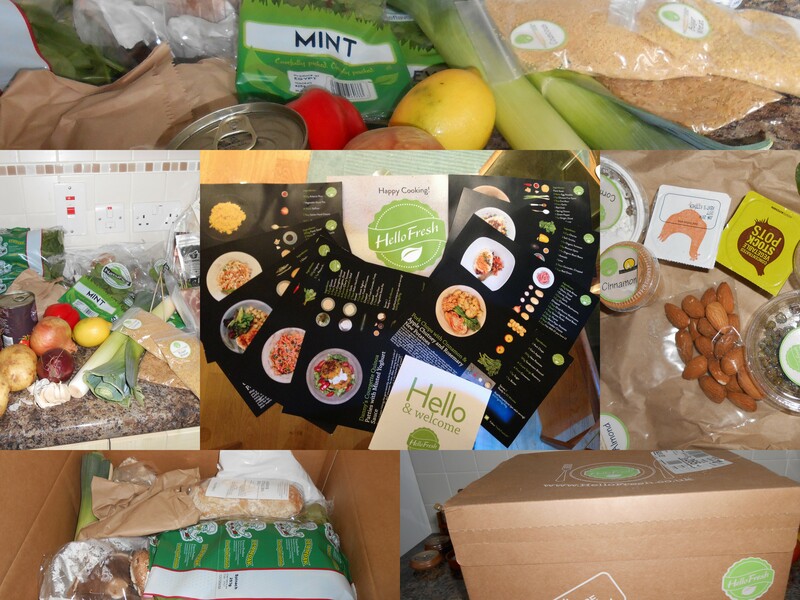 I was a late developer… to foodie markets! It was years of being in London before I discovered Borough Market. I’m pleased to say it was before the hoards of tourists and out of towners who now make it a weekend destination but still I was very late to the party. I was introduced several months ago to Brixton Markets. Allegedly going to be the new ‘Borough’ for foodies ‘in the know’. I’m not sure it’s yet there but for me it reminded me of overseas trips to busy undercover markets. Where food stalls adjoin shops selling dishcloths. Upcycled furniture next to second hand ‘tat’. I worry that it’s loosing it’s identity in order to become the foodie destination that in fact everyone is seeking. Rather than filling the units with artisan and authentic outlets, it may be a little too chi-chi and sell over priced olive oils! I’m quite sure that it will be a destination soon but for me, it’s not quite yet. 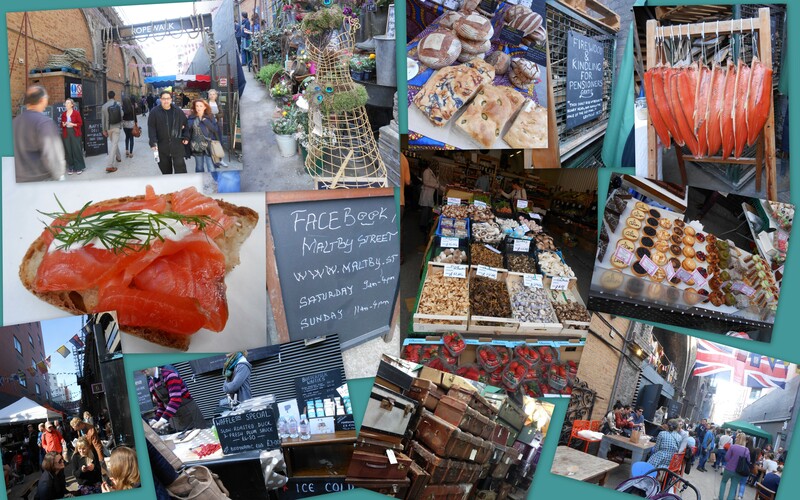 So I was delighted when a friend was staying for the weekend and suggested we visit Maltby Market. Again a foodie destination and unsure what we were to find there, we arrived hungry and ready to sample some deliciousness. Now don’t tell everyone about it though. It’s currently a delightful small market that has just the right level of bustling going on. 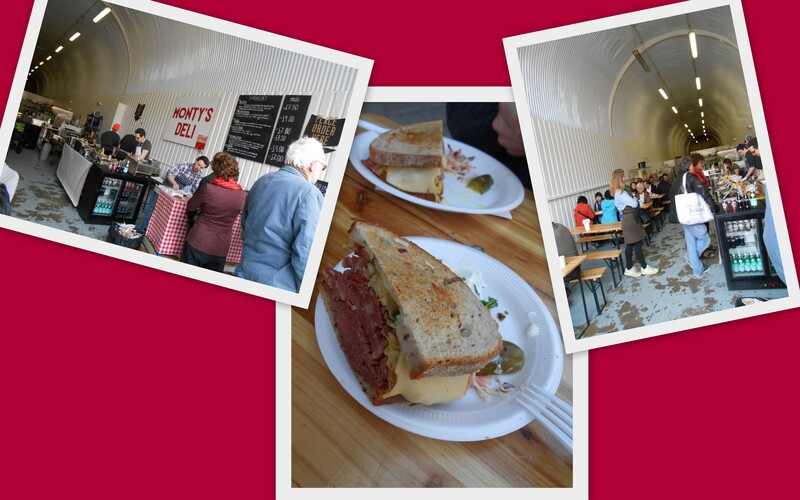 Stalls, stands and small outlets hidden in the railway arches serving a good all-round selection of delicious goodies to eat there. Several outside tables and chairs with a constant stream of users enjoying the fayre purchased. It had a wonderful feel about it. We said we felt a little less trendy than most of the other visitors but what we all had in common, was an obvious enjoyment of the wares on offer. We walked up through the market resisting the urge to sample everthing on our journey. Al had seen a TV program with Tom Kerridge who had waxed lyrical about the salt beef and pastrami sandwiches sold there and we were determined that this should be ‘lunch of choice’. Well it’d be rude of us not to check them out…. Served with imported cherry soda and cream soda drinks. Fabulous. We chose the ‘Reuben’ which was a combination of pastrami and salt beef in toasted bread with a side of pickle and coleslaw. We also felt a need to try some Latkes which are Jewish potato rosti – thoroughly recommended. They were huge sandwiches, so I’m pleased we chose to share one and the Latkes between us… meaning that we were still able to sample some more on our return back down the market. There were items to sell and take away with you but the majority of the stalls were serving goodies that you wanted to eat immediately. Helped of course by the Spring sunshine and general weekend-ness, I’m sure. I shall definitely return to the market for some weekend brunching and munching. In some of the neighbouring arches there are also a selection of vintage furniture, clothing and objects for sale. Fun stuff and great selection. Al needed to fill up his stock of Monmouth Coffee so this required braving it and heading to Borough Market. 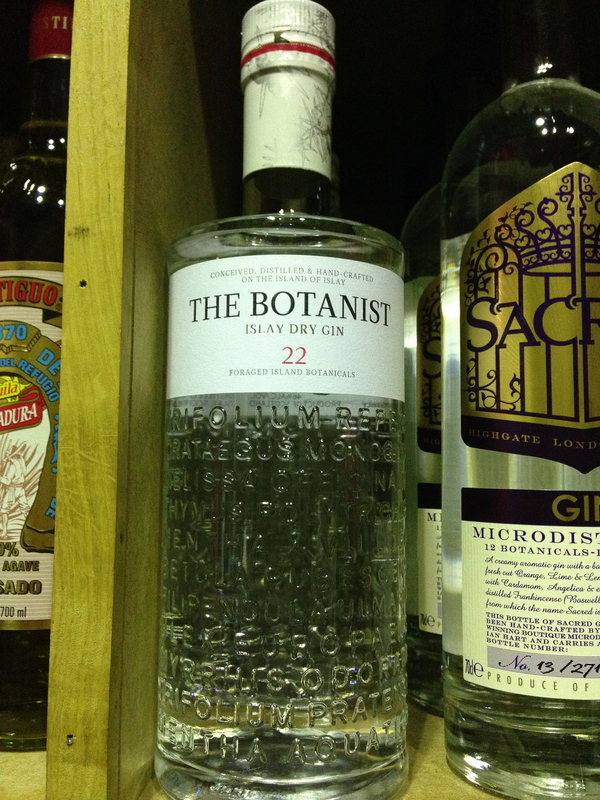 My gin also needed replenishing and the Whisky shop at the back of Leithwaites kindly stocks my favourite, The Botonist. Fortunately only a short walk away and knowing exactly where we needed to be in the market was quickly navigated and out of there. Wow that place was heaving! 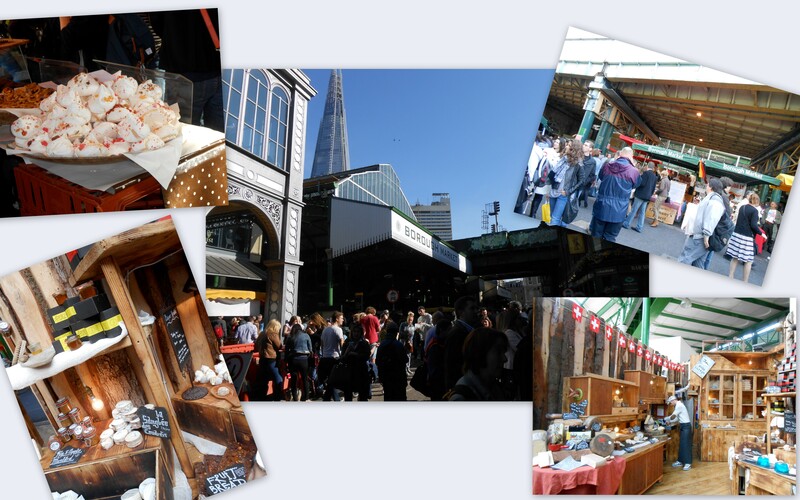 A short bus ride up to Liverpool Street and a short walk through to Spitalfields Market. Again a busy destination for a sunny Spring day but none the less fun and full of goodies. Certainly not as foodie nor as busy as Borough. By this time though our feet were tired of lots of walking and our heads were fairly tired of people so we didn’t stay long and quickly found a spot to sit in the sunshine with a cold refreshing beer. Our final stop was the furniture store, Interior Addict, who produce reproduction versions of designer pieces of furniture and lighting. What an incredible selection and despite their substantially cheaper cost by purchasing reproduction rather than original, they are still fairly luxury items. There were however various pieces that I fell in love with and could visualise in an apartment far trendier than my own…. I shall dream some more! Time to head home and rest our feet – G&Ts in hand! I confessed to dinner on Saturday (when perhaps I should have been juicing). Well I figured that I should let you know where we went. My friend, Linda, celebrated her 50th birthday last year at a sister restaurant and had a wonderful meal, wonderful ambiance and most importantly, a wonderful celebration. So this year she decided to celebrate her 50+1 in Tartufo. She chose the venue last year because it was ‘private dining’ ie where you host your party in a private room but with restaurant service and menu. We were to be in the Cocteau room. Sadly I missed her birthday celebration last year so was new this to chain of ‘private dining’ venues. I was however excited to find somewhere new to host parties and importantly, somewhere that was tried, tested and recommended. Linda, being ever efficient, sent us all the menu choices some weeks ago. I thought the options looked great and varied to suit most palates. Great! Then we received an email from Linda talking about the wines. She had been sent the wine list and was more than a little disappointed. The selection was fairly non-descript but even more disappointing was that even the cheapest of wines was a ridiculous price. Obviously we all understand that there’s always a mark-up when you drink wine in a restaurant compared to buying a bottle in a retail outlet. But one particular ‘average’ wine caught our eye… usually £8-10 in a supermarket. £20-25 in a restaurant. £45 in Tartufo!!! Come-on! Really? All of them were similar. So either we drink bad wine, pay a fortune or go teetotal. Linda checked what would be the cost if we bought our own wines. How much would they charge for corkage? Hmmm £25 per bottle! Oh well, it’s a birthday celebration – some people bought their own wine and others drank a glass of wine with dinner. I made the decision that instead, and as I’m on a juicing regimen (ahem) that I’d drive and drink only water. Well I didn’t think I could be THAT bad! So we all arrived on time at 7.30pm and made our way downstairs to the restaurant area only to be ushered back upstairs and asked to take a drink before dinner in the bar. Usually not a problem but I think perhaps another ploy for Tartufo to charge us ridiculous prices. Despite there being a bar that we could order our drinks from, we were told that they had to bring the drinks to us and that a service charge of 12% would be added to the drinks order. Someone asked if they could just have the drinks at the bar but was told that the 12% would be difficult to deduct! A half of lager cost £8 + service, so I dread to think how much the wine or G&Ts were. I can see no other reason, other than another source of income, for our being sent to the bar. We were a private party with a private room with dinner and wine and a start time of 7.30! When eventually we were allowed downstairs, I was pleased to see the private room was beautifully set. Each place had a place-card with our name and the menu we had chosen on it. The floral centrepiece was one that Linda had created herself and looked stunning. Tartufo offer a range of set meal options. We had originally thought we’d have 4 courses however had finally chosen 3 courses so that those who had to run for trains home didn’t get stuck in London or without a course! My meal was delicious, tasty and well thought out. The portions were ladylike – fine for me on a diet not so fine for any of the gentlemen diners! The service was slow and scant. Only when plates were arriving or leaving the table did there seem to be any waiters present. A few of the waiters clearly were having a bad day or perhaps had a bad attitude as felt it necessary, for example, to put wine glasses onto the table with a heavy hand and a huff! I’m not sure what time it was when they asked us to leave our private dining room and move to the drawing room upstairs. Sounds reasonable as they wanted to get in and clear the room? When we got upstairs we found the ‘drawing room’ freezing cold with the door open, the fire not lit and feeling quite uncomfortable. I closed the door and asked if we could have the fire lit. The door was opened again and I was told that no fire can be lit after 11pm in this hotel. Needless to say this drew our evening to a quick close. 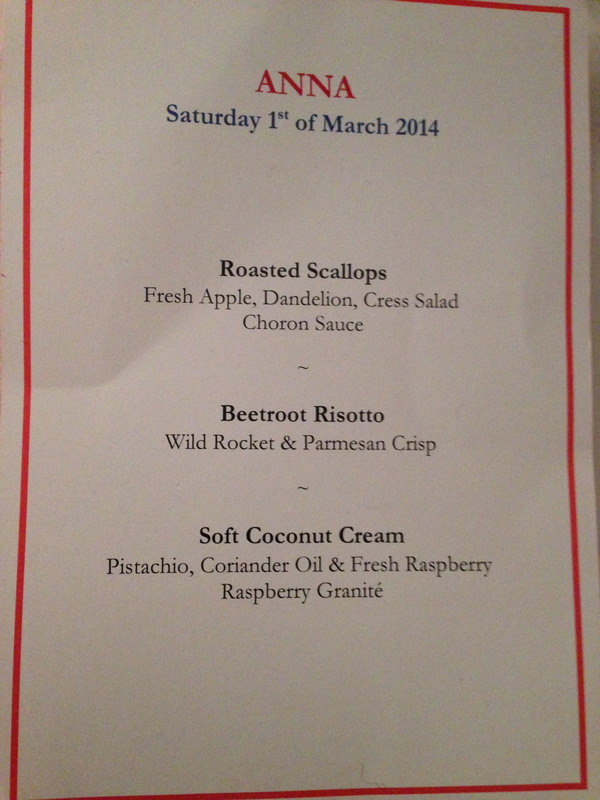 I would love to recommend Tartufo private dining but quite simply can’t. The idea of private dining locations in London where you can arrange a dinner (at a ‘reasonable’ cost) for friends but without the washing up or needing a house extension are to be encouraged. However sadly Tartufo isn’t the venue to use! I’ve always remembered the 5th of November. Not for the usual Guy Fawkes, bonfire or fireworks but because it’s my Godmother’s birthday. However the 5th of November has a new additional memory etched in my mind since my second Phyllodes operation was also on the 5th November 2009! But today is about my Godmother. She invited me to be her +1 and visit Clarence House. Ok so perhaps we’re not going for a cocktail party with Prince Charles but we do get to have a peek in a little bit of Clarence House, drink a glass of Highgrove bubbly and do some Christmas shopping… and all that for charity too! Once a year Charles invites guests to attend a Christmas sale at Clarence House to raise funds for his many charities through The Prince of Wales’s Charitable Foundation. There is a marquee (with errr solid walls) set up in the garden and leading from the house. The marquee is stocked with lots of goodies perfect for Christmas gifts, table presents and stocking fillers. What a wonderful occasion. 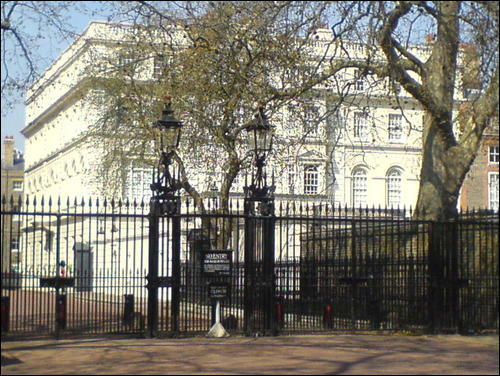 We had our allocated time slot and queued up behind others, including Jan Leeming, before our credentials were checked and we made our way into Clarence House. Our route took us through a lovely entrance way filled with stunning antiques, pictures and photographs, down corridors with walls adorned with equine portraits and into a room that smelt of cinnamon and Christmas as the huge tree sparkled with baubles and reminded us that Christmas really is just around the corner. A glass of bubbly was presented to us by a butler dressed in Clarence House livery together with a delicious mince pie. On the other side of the room were a few stalls set up with some incredible handmade items including some stunning handcrafted jewellery and hats. Then through to the main shopping event in the marquee attached. The space was beautifully stocked with baskets overflowing with gifts, tables adorned with all things fabulous and special. The team clearly did a wonderful job at displaying the items for us all to plunder and purchase. Sadly no photos though as we were asked to turn off our phones and told no photographs. I’d love to post more about the items I bought… but then again the Christmas recipients may well be reading this post! Suffice it to say the The Prince of Wales’s Charitable Foundation has a few more £ in their coffers! Clutching our Highgrove shopping bags we headed up to Piccadilly. 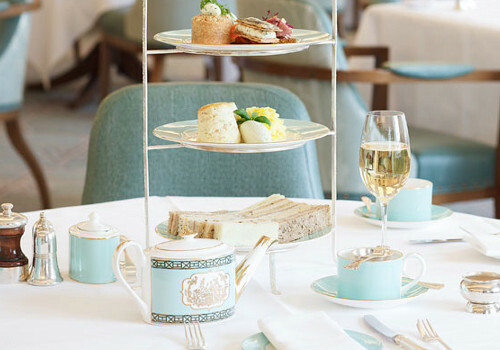 We’d booked a table for afternoon tea in the Diamond Jubilee Tea Salon at Fortnum & Mason. 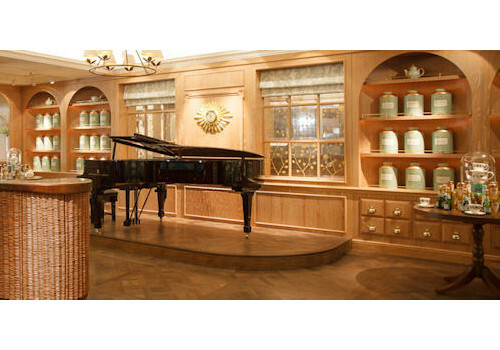 We were greeted on the fourth floor by the wonderful sound of a baby grand piano being played beautifully. 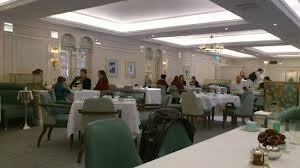 I loved that the restaurant was spacious and the tables set apart from each other. It makes such a nice change to be in a restaurant where you can hear your companion’s conversation rather than the stranger to your right! Also worth remembering if taking afternoon tea and wishing to be discreet or perhaps with someone of an older generation! 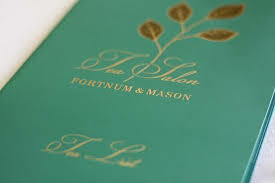 The menus arrived and I was staggered by the variety of teas available and the required choices that needed to be made. Surely a little overkill and confusing for diners? I got lost in the massive selection and we ended up choosing ‘safe’ teas. Our afternoon tea arrived quickly, the teas poured and our waiters then took their leave allowing us to chat privately. The tea was delicious and plentiful. 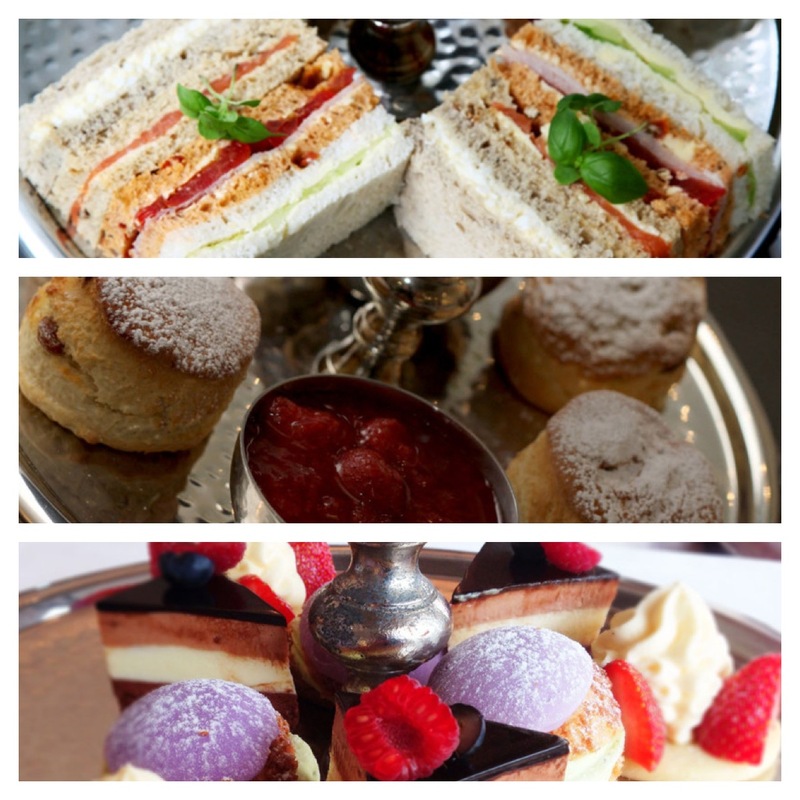 We were offered a replenishment of any of the items as each layer (sandwiches, scones or cakes) was eaten. For us it was plenty and I added a Fortnum & Mason ‘doggy bag’ (errr beautifully packed F&M box tied with a ribbon) to my shopping bags. We laughed that I had not dressed appropriately to match my coordinated shopping bags. Highgrove and Fortnums both share the same distinct blue/green. Next year I shall go prepared! The sun was shining and there’s a food fair on… well it’s be rude not to attend, right? Barnes Community Association are hosting, for the third year, a Food Fair on the Village Green. What a stunning setting it is too. Just over the bridge from bustling Hammersmith. Until you visit these little places you forget that even in London, we do have little villages. Not only do we have them but they are places of beauty and quiet. 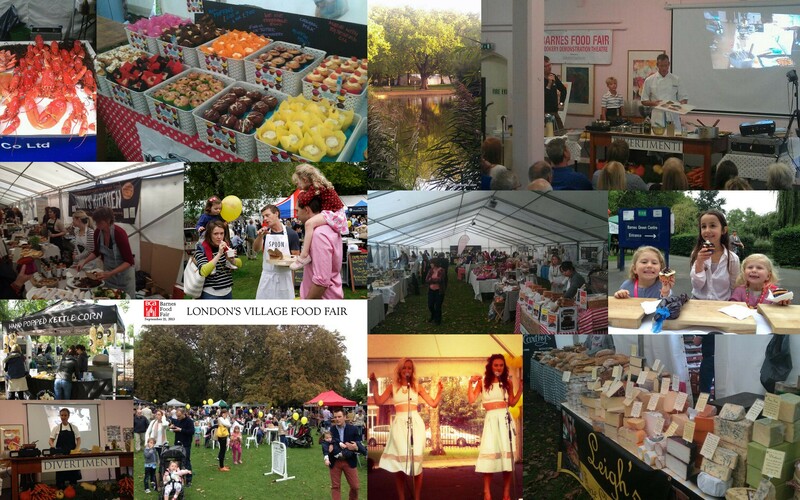 The premise behind the Fair was to introduce people to the fabulous amount of quality food providers, restaurants, delis and other food outlets in the area together with raising funds for the local community association. The marquee was packed with stalls selling all sorts of goodies. Matt and I managed at least 3 circuits, tasting and purchasing as we went. We then wandered round the outside stalls (more tasting and purchasing). Then, we found a couple of chairs and a corner of a table in which we set about eating our, now substantial, picnic. There’s nothing like comparing different sausage rolls and pork pies! A little envious though when we spotted a black pudding sausage roll and realised we didn’t have room to eat any more! There’s plenty of entertainment too. A stage hosting a selection of singers, choirs, orchestras and bands… all of whom are local. A nearby building hosted cookery demonstrations by none other than Angela Hartnett, Phil Howard, Theo Randall and Ken Culhane. Introduction to all sorts foodie for the small people dotted around the Fair. They even have a doggie creche so you can browse the fair without worrying about your mutt eating everything in sight! We were very impressed with the Fair. The variety and quality of hot and cold food outlets to choose from. We were also introduced to a number of local restaurants and bars that we weren’t aware of… and will now visit. In addition to a very quick catch up with Phil Howard, I also managed to meet up with a couple of people who did the Food Writing Course with me, Adrienne and Nova. Great to hear what they’ve been up to and also to see Adrienne hard at work with School of Wok. I’m quite sure this event will grow and grow in future years. The Fair was constantly buzzing with a great flow of people coming and going from the event but never emptying out! I’m not sure how much the event raises for Barnes Community Association‘s charity but we shall certainly be back next year to spend our pounds and pennies again. Well done Issy for finding another place for a quirky and fabulous afternoon tea. 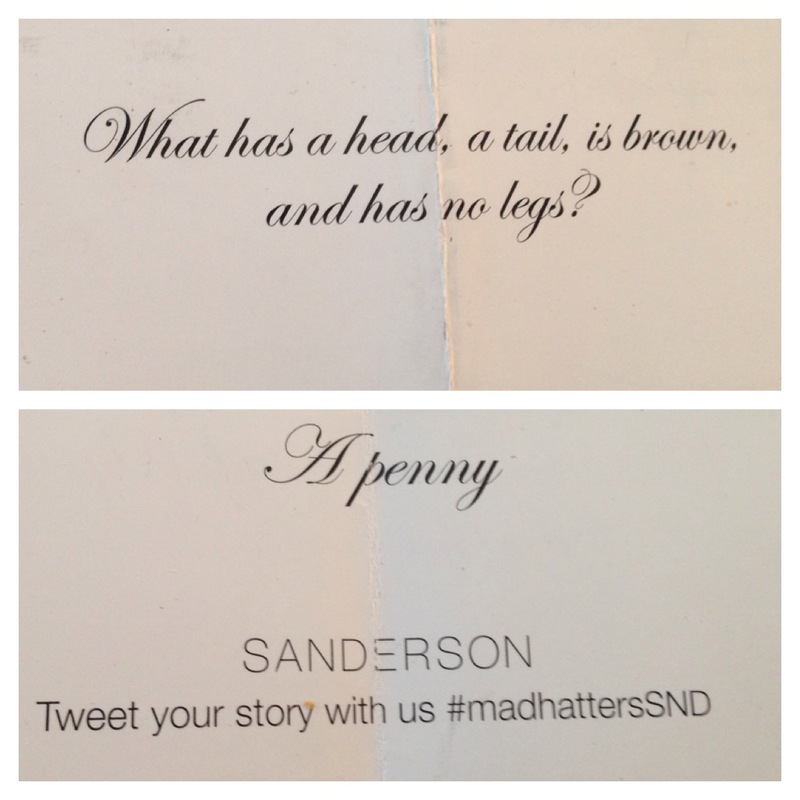 For some, truly odd, reason I’d not even heard of The Sanderson’s Mad Hatters Tea! Where have I been? Our table was dressed with the some extraordinary crockery, fabulous starched linen napkins and an array of cutlery. 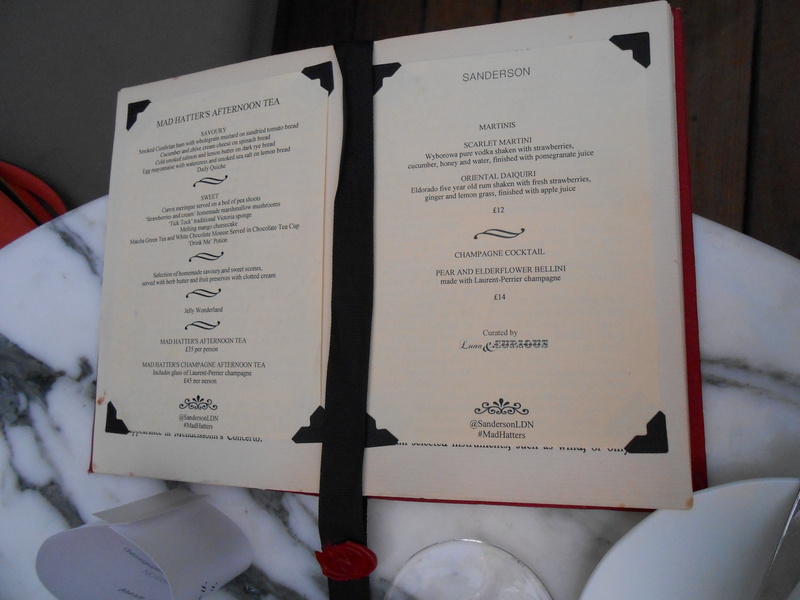 Our waitress appeared quickly and presented to us a vintage book which contained our menu for afternoon tea. 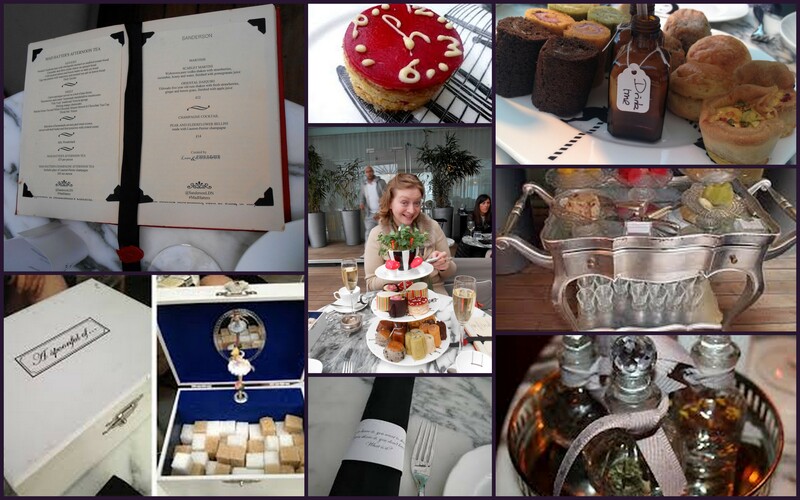 We chose our tea (and bubbles) and soon the entertainment began! We looked at our napkins which were neatly wrapped with a paper cuff revealing a riddle. Next to arrive was our Tea. Delicious and fragrant choices. Sugarcubes were offered to us within a delightful little music box. The afternoon tea was then presented to us with enormous flair and descriptions of each component explained. Mighty tea indeed but each part recalling an element of the story from the Mad Hatters Tea Party. What a fabulous idea. Such fun. There was even a selection of fanciful jellies. My only criticism, if there need be one, is that the tea is best for the sweetest palate! Oh and don’t eat ANYTHING before you go.. it’s quite substantial! For quite some time we’ve had a date blocked in our diaries and a table booked for a dinner at The Square in Mayfair. A foodie evening with wonderful company. Each and every dish was utterly incredible. The food delectable and delicious. Lots of satisfied sounds coming from our table whilst we ate each and every morsel from our plates. 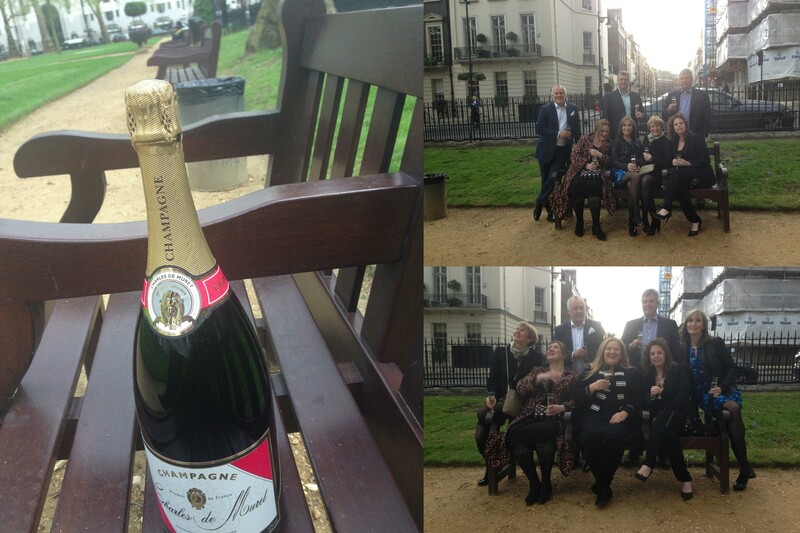 BUT before we headed to the restaurant we met at my bench in Berkeley Square. I so love meeting friends and family at my bench and sharing my favourite place with them. I also love bubbles… hehe and for this group we needed a super large bottle! I love my life. I love new experiences, trying new things, seeing new places etc… you may have guessed from some of my posts! So when opportunities present, I’m prone to say a big YES! Today’s adventure was no different. 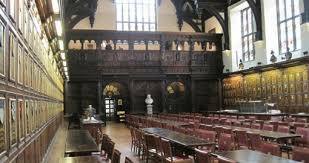 I was invited to take lunch in the Hall at Middle Temple in London. Middle Temple is one of the four Inns of Court established in the 14th Century. You can read more about the Temple here. However of interest today was the fabulous Elizabethan Hall. Over 101ft long and barely changed since it was built… including some of the tables where we sat. There are still many rules by which you should abide whilst lunching there… fortunately my friend knew the rules and who was who in Chambers. If you love a quirky place that is steeped in history then do consider going here for lunch or taking those ‘out of towners’ to somewhere new! You can find out more here. There’s something super special about finding fun and interesting venues to take afternoon tea. I love the traditional but I also love the quirky! Today Issy and I met up at Cannizaro House in Wimbledon for afternoon tea, a glass or two of bubbles and a great catch up. Such a gorgeous venue, whether you’re staying, dining, having afternoon tea or meeting friends for drinks on the terrace. For us, afternoon tea was perfect. What I haven’t got photos of is the delicious rabbit shaped shortbreads! Lovely long afternoon catching up and putting the world to rights. Although our interest was peeked when we realised that the terrace was obscured from our view today.. clearly there is work afoot and rumour has it they’re building an Orangerie – can’t wait!